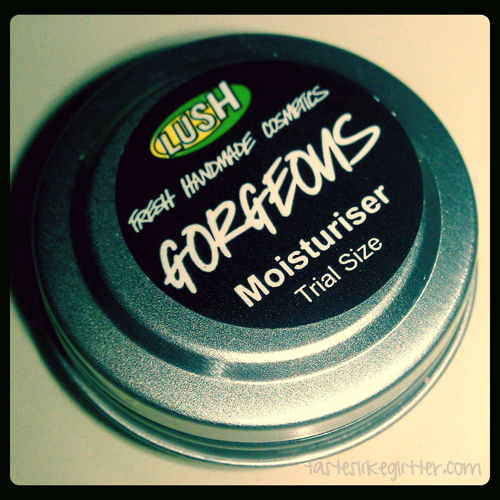 For a long time now, I've been lusting after Lush's 'Gorgeous' moisturiser. Compared to others in their range, most being around the £10-£13 mark, this is steep in comparison at £37.50 for the full 45g size. But I received the 'Hello Gorgeous' gift set for Christmas, clue should of been in the name really but I was surprised to find a trial size of this in it. This is our ultimate face cream. The one where we didn’t hold back and used the very best, most effective ingredients in nature’s store cupboard, with no expense spared. We make a light, loose emulsion from six beautiful plant oils. We then blitz fresh pineapples and filter their juice, squeeze fresh organic lemons and oranges, add orange blossom honey water, neroli essential oil, orange flower absolute and myrrh – then blend the whole lot gently through the cream. For a light touch, you want Gorgeous. Its magical ability to melt into your skin is unmatched, bringing with it six gorgeous organic oils and butters, the finest we can get our hands on. No matter how your skin behaves; Gorgeous is suited to everyone. The emollient oils are combined with fresh fruit to give you a soft, matte feeling, perfect for daytime. It's a super rich cream and a little bit goes a long way. The first time I popped it on, I did so without a mirror and I was half expecting to look like a grease ball when I ventured into the bathroom. You know how rich moisturisers can often leave you looking super shiny? This doesn't, I actually couldn't believe how matte it made my skin and I've managed to skip Illamasqua's Matte Primer because of this. It also smells amazing! I cannot stand to put anything I don't like the smell of on my skin, especially my face. I bought Skin Drink back along without going in store and sniffing it first and I mighty regret it because it smells absolutely vile. I really do the love this and like I said, a little goes a long way. It's not expensive as some facial creams on the market. Creme De La Mer, anyone? But do you think it's honestly worth shelling out for good skin care products if you know they are going to work for you? I vote yes, because after all - you only have one lot of skin and you really should look after it. What's the most you've spent on a single product?